The story of this panel began a few years ago whilst I was visiting family in the UK. 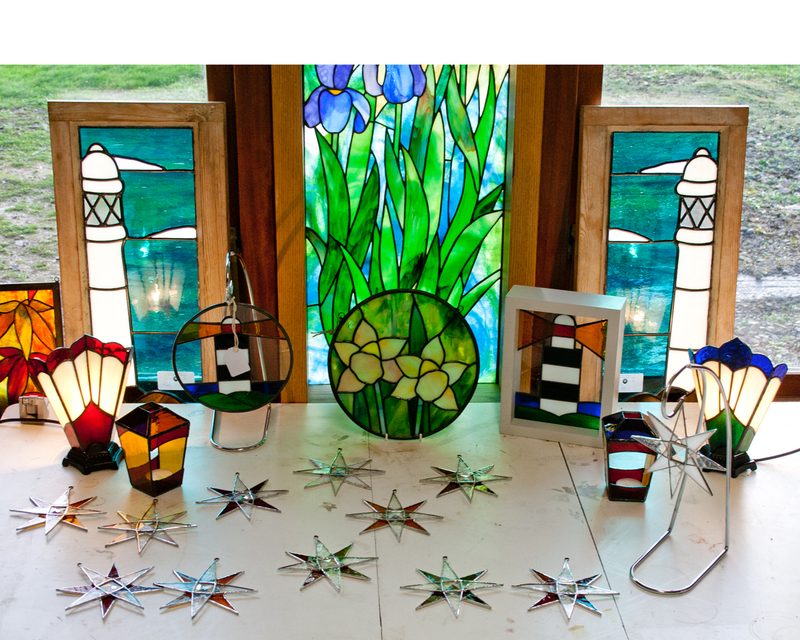 I managed a visit to Kansa Stained Glass where I was fortunate enough to purchase two sheets of Uroboros art glass which is hard enough to find at the best of times. The first sheet I pulled out of the rack was this one, code 10-16-5 Light & dark browns, turquoise with mini fractures.My first thoughts were I loved the colors and it would make a great background glass. The next sheet I pulled out was this one 60-25-5 Red,orange & white at this point I thought “Poppy panel “. Over the next few years I made a few attempts at a pattern, which for various reasons I had to shelve, but in October 2018 a window of time opened up so I went for it. The colors of the two sheets gave me a feel of Liberty/Art Nouveau which strongly influenced the final design. I have cut the top and bottom background here, the leaves ( Youghiogheny stipple 4117 Green, ice white & bluish grey ) and the soil ( Uroboros granite backed 65-17 Light & dark browns ) Ready to add the flowers now so hoping I’ve got it right. 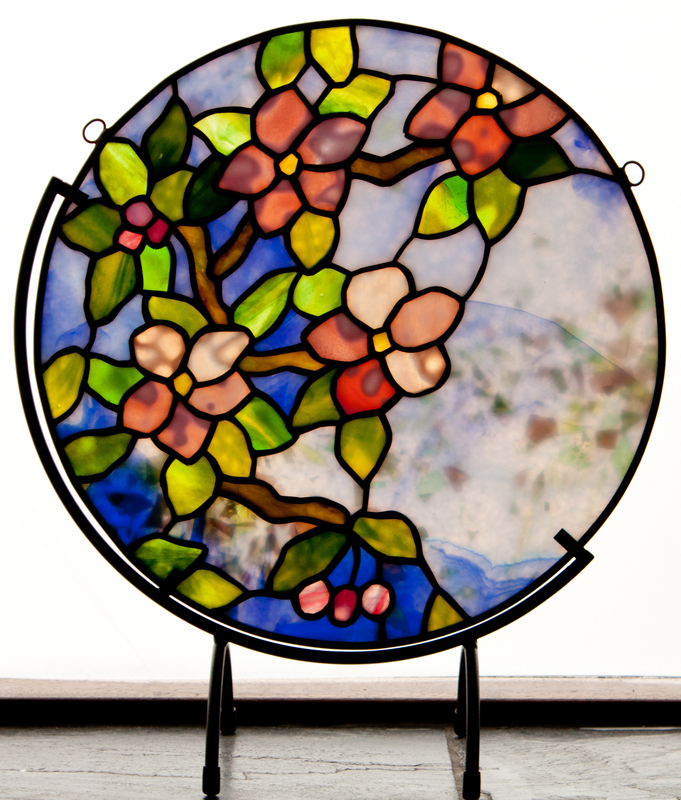 Staying with the ” Tiny Tiffany ” theme this time I have gone for an Apple Blossom design, the background glass here is a Uroboros fracture glass code 10-55 Cobalt Blue, White and Green, this panel can be hung in a window or placed in a stand as shown here, The original panel size is 12 inches, ( 305 mm ) diameter.. Original panel size is 12 inches, this can be scaled up using the printing instructions included in the PDF download. I am now starting to foil the pieces, I do this by removing them one at a time and then replacing them as I proceed. I find this method works very well as you are able to make minor adjustments as you work across the panel. Here is the panel with all of the foiling complete and I will now proceed with the first soldering, once this has been completed the template can be removed and the first solder can be repeated on the reverse side it is important to be very careful with the panel during these stages. First soldering completed on both sides and the perimeter lead added, you can see the two pieces of black tape securing it to the panel until it is soldered into place.The final bead solder can now be added to finish the panel. Bead soldering completed and patina added and you can clearly see the difference the bead solder makes to the panel, gives it a nice finish. We are delighted to be able to offer this design for sale as a full size pattern 38.25 inches x 18.75 inches, ( 972mm x 476mm ) and is available on Etsy https://www.etsy.com/ie/listing/473515336/clematis-stained-glass-pattern-david?ref=shop_home_feat_1. It is in PDF form and can be printed using Adobe Acrobat Reader. 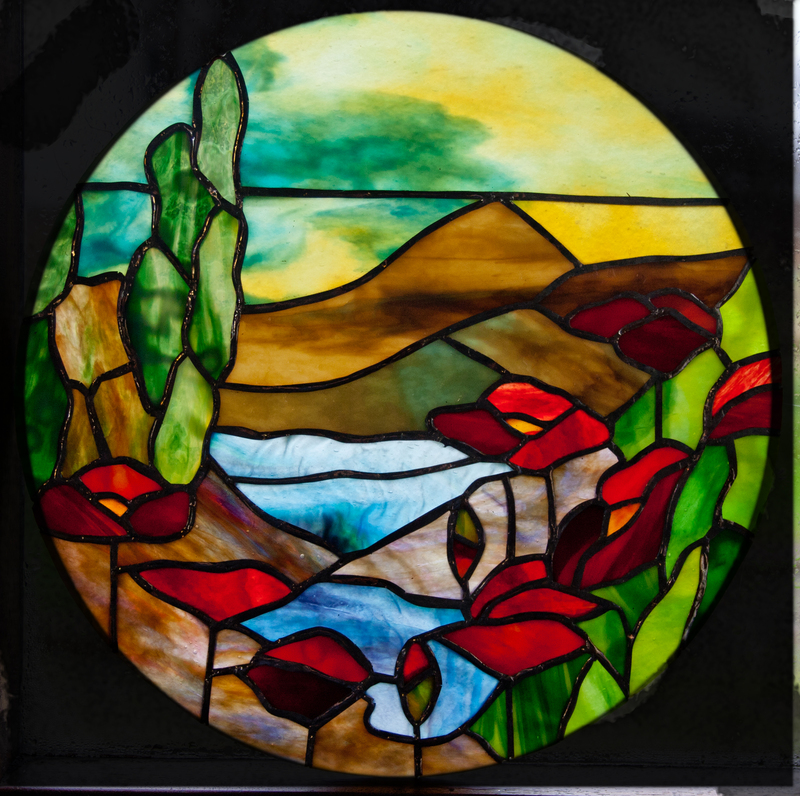 Back in January we posted a small panel ” Scene with Poppies ” Shortly after we were contacted by GPQ , and as a result this design has been published in the current issue, along with a pattern and tutorial on how to construct this small panel. Here is the finished panel . 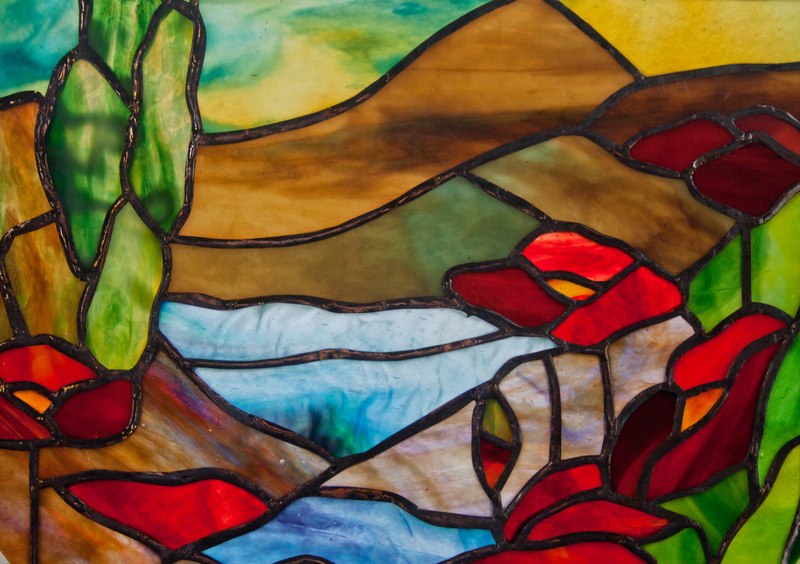 This piece has been cut and sitting on the workbench for the past two months so I am delighted to have it complete and able to post pictures. Staying with the ” Tiny Tiffany ” theme this time I have gone for an Apple Blossom design, the background glass here is a Uroboros fracture glass code 10-55 Cobalt Blue, White and Green, this is the reverse side and you can see the fractures in the glass. I think the fractures prove very effective when viewed from the front adding a sense of depth to the composition. © David Kennedy 2016. 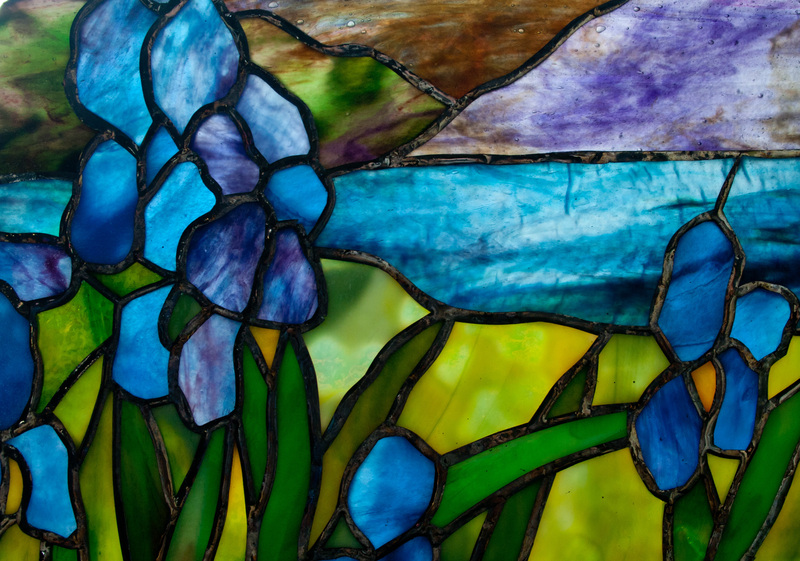 Effort number three in my ” Tiny Tiffany ” series is another scene, this time using irises which just work so well in stained glass. Getting some small pieces of yellow in here was a bit of a challenge but like to think I managed it ok. I find using the water glass really adds another dimension even though the piece is so small. This is a close up of the piece. When using art glass you invariably end up with lots of different pieces of odd glasses that you simply don’t want to dispose of. After a while these start to mount up and take up space so some thing has to be done with them which leads to this panel. 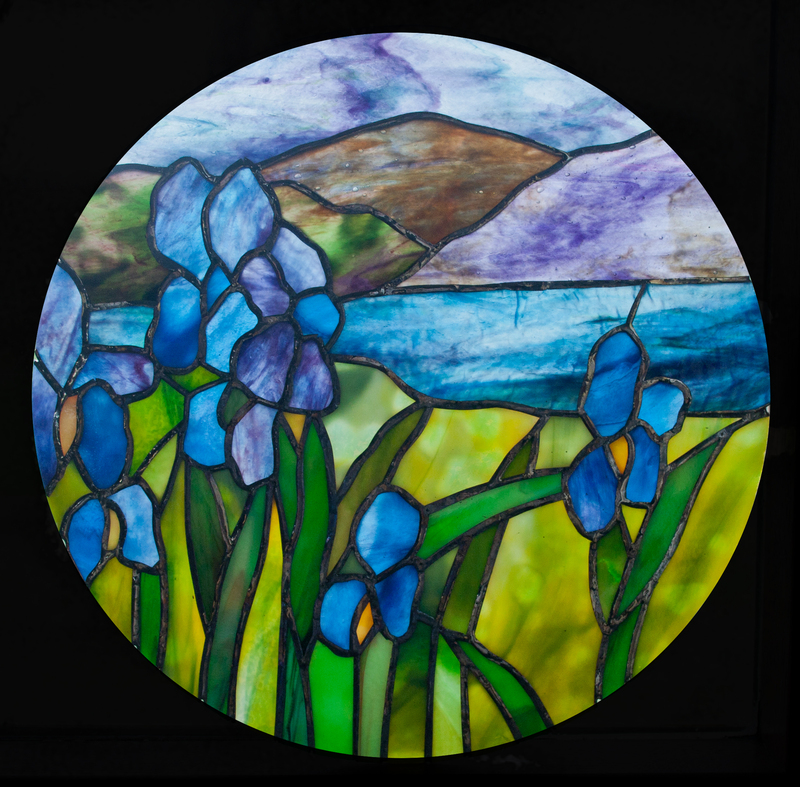 I have taken the idea from a ” Tiffany ” window, I’m not sure how large the original window is but my small panel is 12 inches in diameter, a Tiny Tiffany if you like. I wasn’t sure how this would work out but I thought I would give it a go anyway, having seen the end result I may well try another one so watch this space.